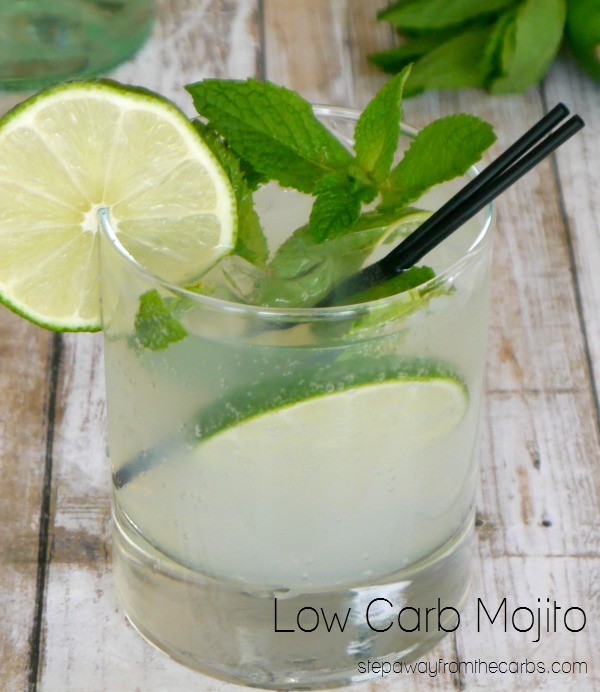 This low carb mojito is a wonderfully refreshing cocktail! 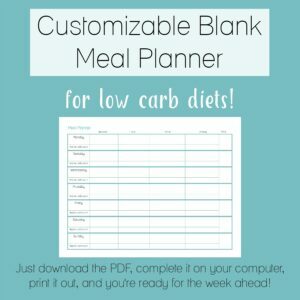 Sugar free and keto recipe. 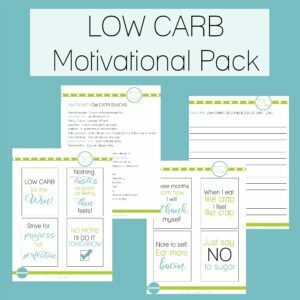 I really enjoyed making the strawberry daiquiri a few weeks ago – so next I tried making a low carb mojito! 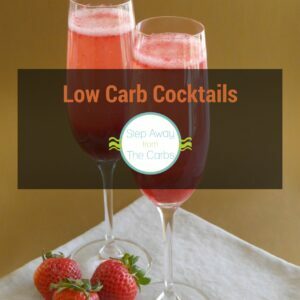 I love cocktails but I rarely order them in bars or restaurants these days because the ones I like usually contain far too much sugar. 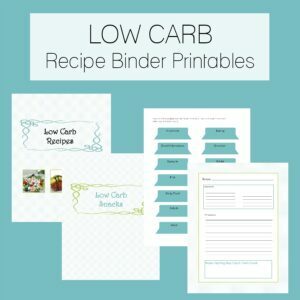 But some cocktails are pretty easy to convert to a low carb version and this mojito is really refreshing! The first step is to muddle the mint in a glass – muddling releases the mint oils and is essential for the flavor! You can muddle with a cocktail muddler or just use a wooden spoon! In a cocktail shaker, add some light rum, lime juice, sweetener and lots of ice. Up to you which sweetener you use – I’ve tried it with granular Swerve and it was really good. Liquid stevia would work well too – especially if you were making this without a cocktail shaker. Shake it all up and then pour it over the mint. Top up with club soda. Love this Mojito? 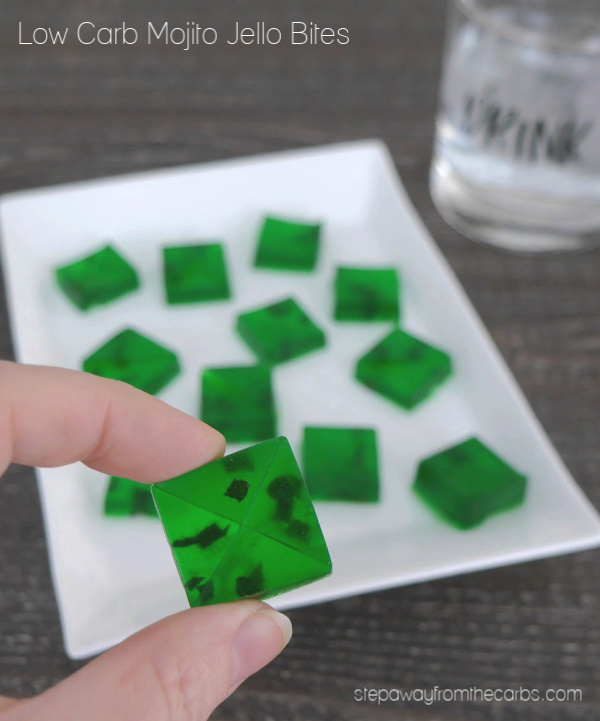 Try my Low Carb Mojito Jello Bites!!! Muddle the mint leaves in the base of a glass with a wooden spoon or muddler. In a cocktail shaker, add lime juice, rum, sweetener and ice. Shake until well mixed. Pour into the rum mixture into the glass and top with club soda.